From the Aao Ji department... Run This Town @ Brave New Books tonight, July 19th! Run This Town is here to give the Hip Hop community in Austin a platform from which to express our views. At this meeting, we will further discuss the direction that Run This Town will be going, upcoming events, and the roles we can all play in the movement. We will also, as usual, open the stage up to 10 willing performers. The link below is a map to the location. After the meeting, we will be heading to , a bar on 6th street, where any artist can bring their music and have it spun in a club setting as we enjoy $2 wells. 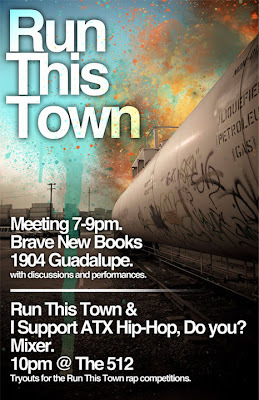 In partnership with the Facebook group, "I support ATX Hip Hop. Do you? ", Run This Town wants to help create an environment in which the Hip Hop community can mingle, network, and hear what music our scene has to offer. This mixer will also provide opportunities for rappers who want to be involved in the next Run This Town event's rap competitions. is a great venue that is supportive of our movement. The link below is a map its location. It was formerly a place called Wave, as the map will show, but the address is correct. We really look forward to seeing you there. This movement depends on our participation and support. Together, through action and art, we will Run This Town!